Thin crispy chips made of beetroot flavoured with nut&raisin sauce with mustard seeds. 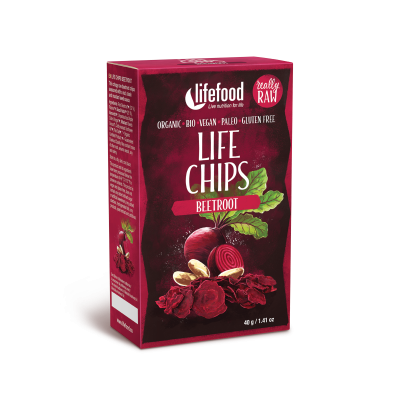 Thin crispy raw crisps made with sliced beetroot and seasoned with a nut, raisin and mustard seed sauce. Dehydrated several days at a low temperature to preserved the maximum amount of nutrients available naturally in the beetroot. 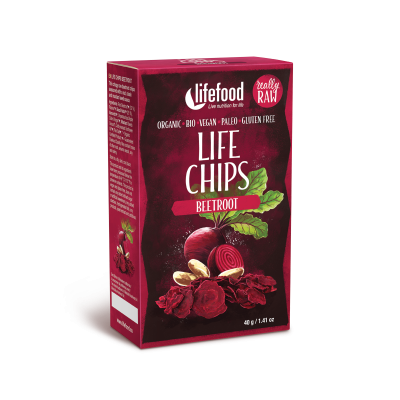 Red Beetroot* (32 %), Raisins* (19 %), Nuts* (47 %; Brazil Nuts*, Almonds*), Unpasteurized Apple Cider Vinegar*, Ground Mustard Seeds* (4 %), Cold-Pressed Sunflower Oil*, Pink Salt. May contain traces of other nuts, sesame seeds, soy and celery.